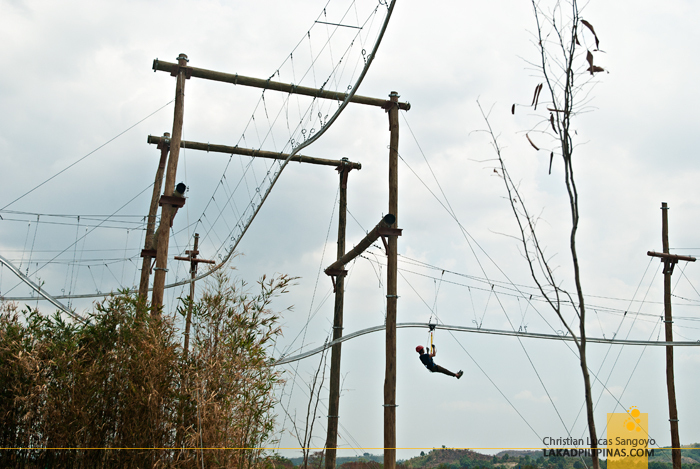 The heat was searing as I tried to conquer the simple looking Aerial Walk Challenge at the newly opened adventure playground in Porac. 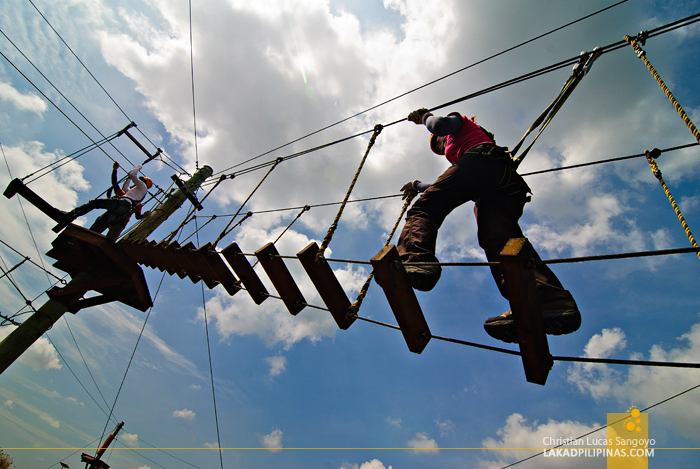 It looked easy, but once I set foot on its obstacles, sweat started to pour from my body like there was no tomorrow. 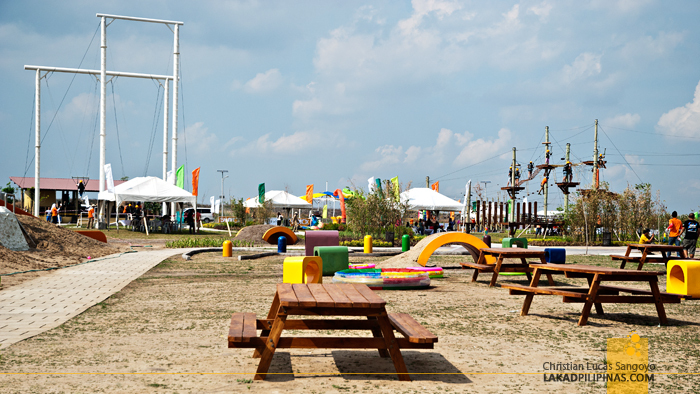 Alviera Sandbox is the newest outdoor adventure park to hit the Province of Pampanga. Like its name suggests, it is a playground of sorts, but with a twist—the games here are really not all for kiddos. 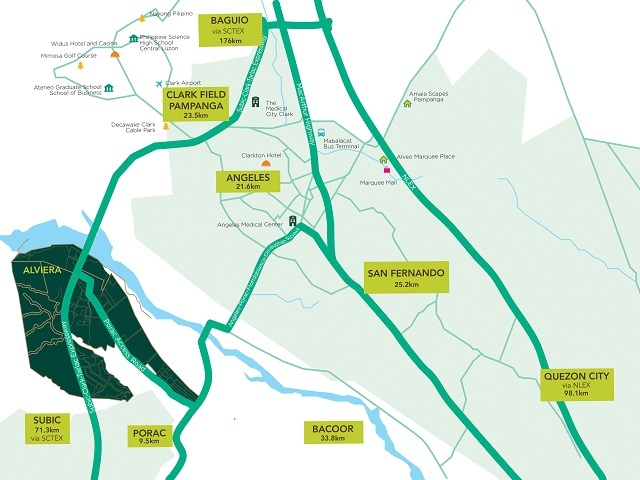 Dotting its thousand or so hectares are two sets of giant swings, a rappelling, climbing and free fall tower, an aerial walk complex, a roller coaster zipline, a pump-track for bikes, and an ATV station for a longer rides outside the complex. We came straight from Manila through an hour and a half van ride. 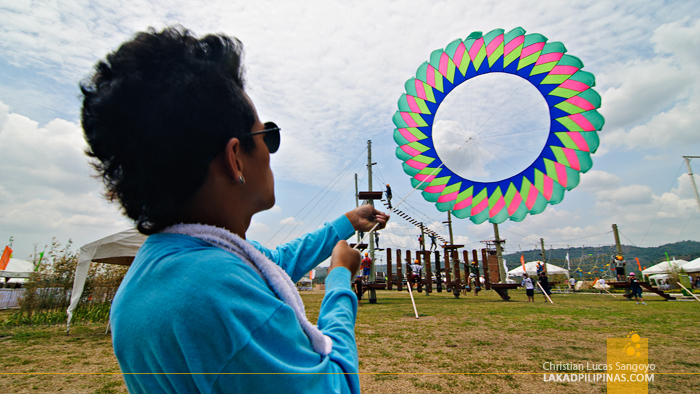 Giant circular kites greeted us as we entered the grounds of Alviera Sandbox. 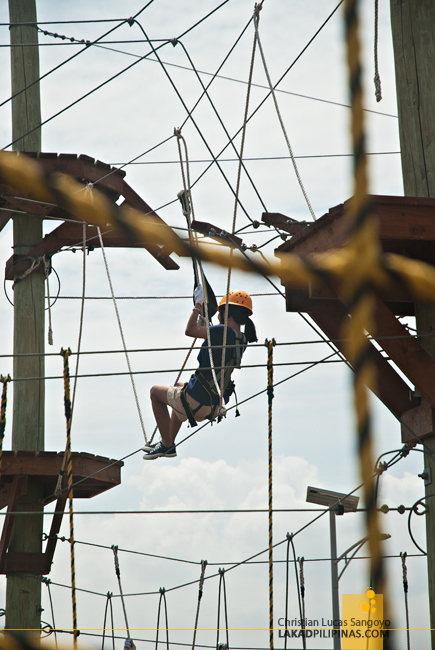 And although I have been hearing about this adventure park on television and travel blogs months before our visit, it was actually the first time it has opened to the public. With tickets to most of the park attractions, we headed to the Aerial Walk first since there were no queues for it. After strapping in, we launched into an assault of wall climbs, rope and log walks, ladder climbs, and all sorts of punishing obstacles. It really looked easy at first glance but it was a very challenging course. It was nothing like Subic JEST camp, which was literally just a walk in the park. It took us more than thirty minutes and all of our energy to finish the whole thing. 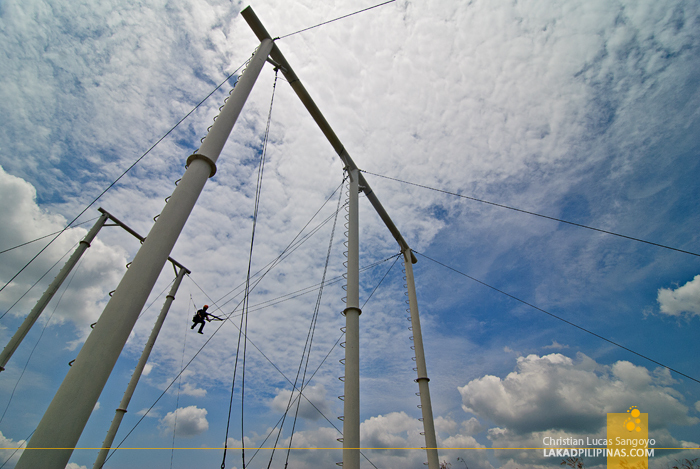 Still pouring buckets of sweat, we immediately headed to Alviera Sandbox’s Giant Swing. Soaring almost 33-feet high, we watched as visitors were hoisted to the peak before they were snappily released and plunge down, hollering and screaming, as they swing back and forth across the air. My heart was in my throat as our turn came. We actually have a choice of doing the ride in singles and doubles, I chose the latter. 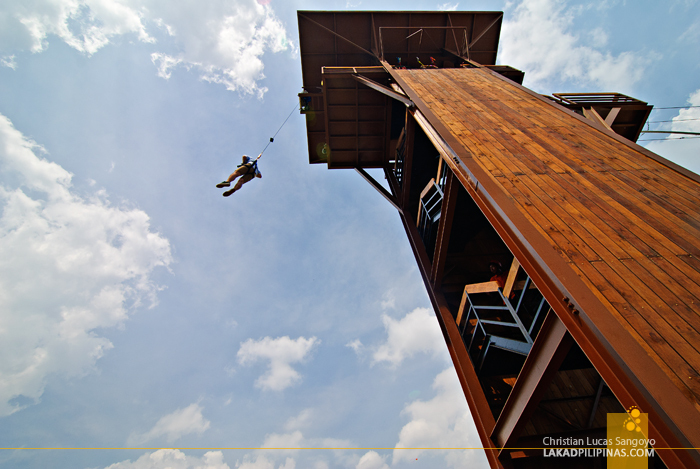 It was an exhilarating experience from the moment we were suspended in the air to the actual plunge. It was such a fun ride that we requested for one more swing. The ATV ride was our next target. I’ve been addicted to these since my Mayon Volcano ATV ride. It was surprising that there were no queues when we got to their booth. 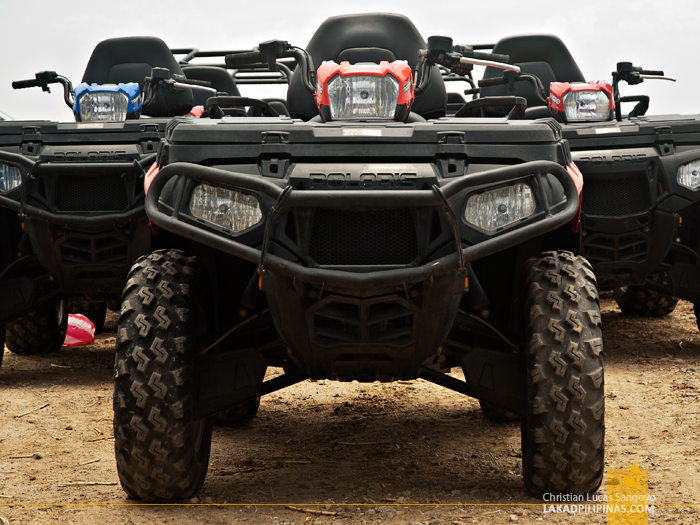 We soon found out why—a ride costs PHP2,500.00 per hour for the ATV and PHP3,000.00 for the UTV. We checked our tickets and it wasn’t included in the package we bought. 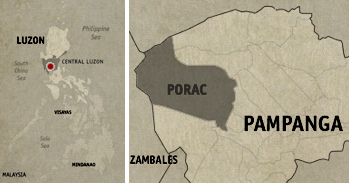 Too bad as I was really looking forward to riding through Porac’s ash-laden landscapes which I first saw on my Mount Pinatubo hike years back. The intense heat of the midday sun forced us to stop a bit and check out the local wares and dishes being sold at the Alviera Sandbox tent. 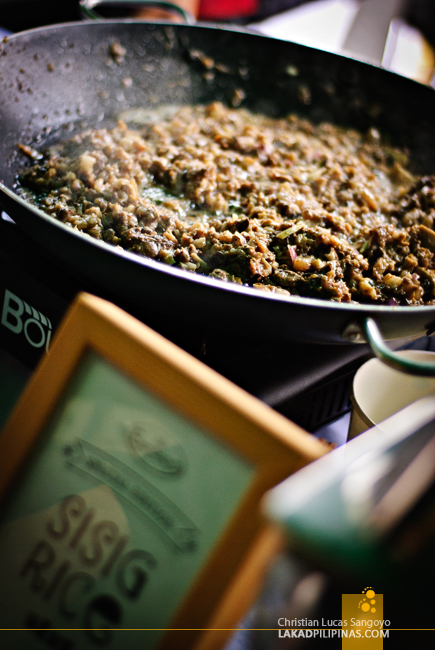 But what caught our attention instead was a booth selling sisig rice. We forgot about buying souvenirs and quickly sat down for lunch. Right beside the Alviera tent is the Adventure Tower. 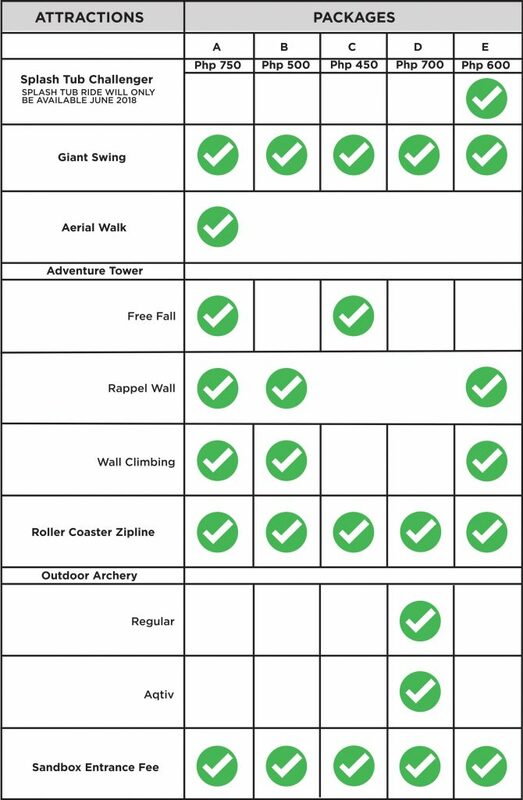 It’s a five-story high structure where one can rappel, wall climb, do a free-fall jump, and ride the roller coaster zipline (or the Avatar One as they dub it). I’m not really interested in wall climbing and rappelling, but I was rarin’ to try the free-fall jump and the zipline, which as Alviera Sandbox claims, is the first in the country. The queue was quite long and a bit disorganized, which is I guess understandable since it’s their opening day. It took almost an hour before I was able to ride Avatar One, and after which, there was no more time to try the free-fall jump. 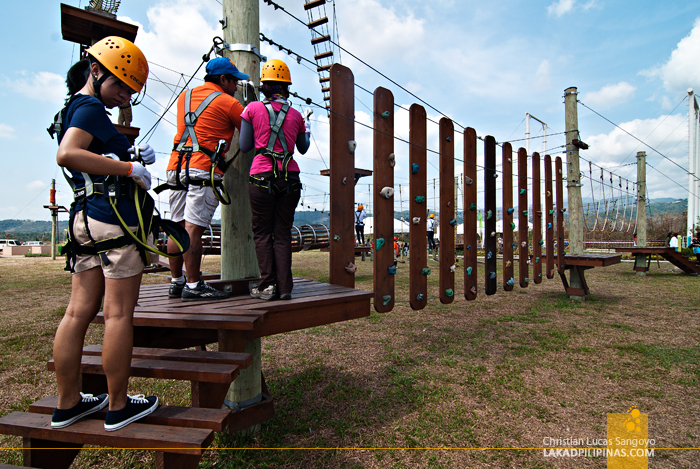 It was quite an experience though as it differs so much from your normal straight-cut zipline. At Alviera’s Avatar One, you actually zip through like a rollercoaster; from left to right, up and down. The sun was on full blast the whole time we were at the Alviera Sandbox; it was quite hot, with not that much shades on the ground. Some of the queues were quite long and the activities were very physical. But all in all, it was still a very fun visit. We can just guess how our muscles and joints would ache the following day, but yes, we would gladly do all of it again. 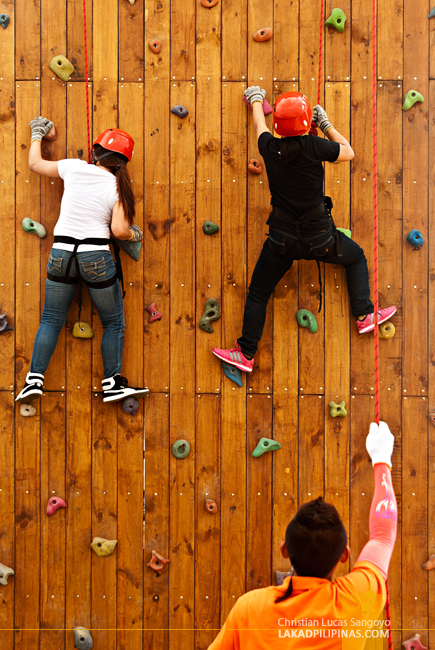 ~ BIG THANKS TO ALVIERA FOR INVITING US TO VISIT THE ADVENTURE PARK. VIEWS AND OPINIONS ARE ALL MINE. I was there with my kids during the media preview! I didn't see you. Good Day! I am student conducting a study about "The Conpetitiveness of Alviera Sandbox as an Adventure Tourism Attraction" as a requirement for our Methods of Research subject. In this regard, I would like to ask you to be one of our respondents to answer the questions honestly and completely. Your response will be highly appreciated and that all information will be used for academic purposes only.